This is a stunning luxury penthouse apartment, located on the 18th floor of Jomtien Beach Condominium S1, within a very short walking distance of Jomtien Beach and offers stunning sea views. The apartment has been renovated to a very high and luxurious standard; it is superbly decorated and tastefully furnished throughout. The Penthouse consists of a large open plan living, dining and kitchen area, two large bedrooms, three bathrooms and two balconies. Being fully and stylishly furnished it is ready for you to move in to now! The stunning European style kitchen is ultra modern, has been cleverly designed and features excellent under cupboard lighting. The kitchen is fully equipped with all you need, including pots and pans, crockery and cutlery and cooking utensils; along with an oven, electric hob, extractor fan, microwave, refrigerator, a large corner sink and plenty of storage and work-top space. The main living area contains a huge corner sofa, a lovely glass coffee table, storage and display units, a large flat screen TV and DVD player, along with access to one of the balconies via the large sliding patio doors. There is also a dining area with a stylish glass dining table and four chairs. The three bathrooms are all very modern, fully tiled and have been finished to a high standard, they all include a toilet and large marble topped units housing a basin with storage underneath. The two en-suite bathrooms feature large walk-in showers, and the main bathroom includes a large bathtub and a separate shower unit. The second bedroom is of a very good size and is furnished with a large double bed, lots of storage space including a huge built in wardrobe, drawers, cupboards and bedside cabinets. There is also a flat screen TV, an en-suite bathroom and access to one of the balconies via large sliding patio doors. The main bedroom is a very large space, running the width of the apartment; this extra space gives the benefit of housing a pool table. This bedroom is accessed from the main living area via huge sliding doors which open up to reveal the pool table area; here there is an impressive LED lighting system which looks fantastic at night and is a great place to relax and enjoy a game of pool. This area has plenty of space for you to play, and includes a mounted unit to store your cues, a scoring board and spotlights for extra lighting. The bedroom itself, along with an en-suite bathroom, contains a large double bed, bedroom furniture including a wardrobe and bedside cabinets, a flat screen TV and DVD player and access to one of the balconies via large sliding patio doors. Being on the 18th floor each balcony of this Penthouse offers stunning views, including sea views over the Gulf of Siam, including the islands here such as Koh Larn; there are also views of Jomtien Beach and of the Jomtien and Pattaya areas. There is also balcony furniture included for you so you can relax and soak up the spectacular panoramic views. The apartment also benefits from impressive feature ceilings with concealed dimmer lighting in the living area and bedrooms. There is marble flooring throughout the property, along with curtains, down-lighting, air conditioning and ceiling fans. Residents of Jomtien Beach Condominium S Buildings enjoy some fantastic amenities, including: a beautiful salt water swimming pool with a children's pool, a fitness center, a children's play area, free undercover parking, and a range of small businesses within the complex such as laundry, WiFi (available to purchase on a pay-as-you-go-basis), massage parlors, beauty salons and shops; there is also 24 hour security. The complex is located in Jomtien and very close the fabulous 6 km long sandy Jomtien Beach, which offers plenty of space to relax on the many beach chairs here, enjoying food and drinks served by the beach vendors here; along with a choice of water-sports to enjoy. Jomtien is a fantastic area and offers many amenities, including a variety of restaurants offering a both local and international dishes; a lively nightlife with a fun atmosphere - a large variety of bars, cabaret and entertainment venues to choose from (including Super Town - Jomtien's Walking Street); there are also many shops, fresh food markets and two fantastic night markets. 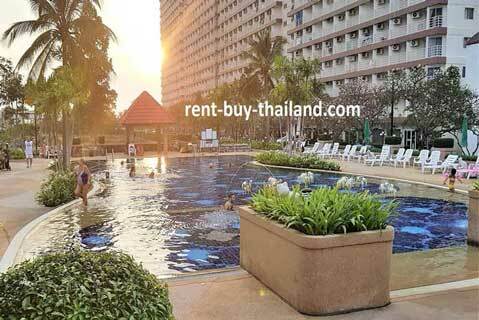 Central Pattaya is easily accessible from the condominium, being a short drive or Baht Bus ride away - the main Baht Bus route between Jomtien and Pattaya running along Beach Road which close-by. Central Pattaya is known for its popular and lively nightlife, with a multitude of nightclubs, bars, restaurants and cabaret shows as well as the famous Walking Street; there are also an abundance of shops, markets and a variety of tourist attractions in the area for the whole family to enjoy. 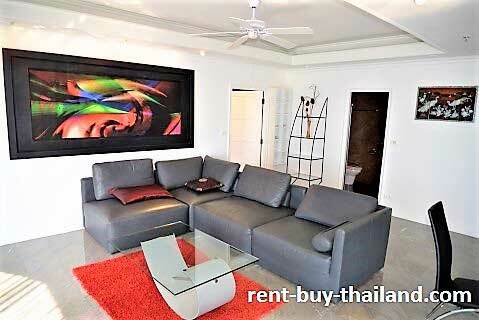 Rent-Buy – You could rent-to-buy this Penthouse in Jomtien with a flexible payment plan. Easy payments available helping you to own your dream property. We have a large number of other condos in the Jomtien, Pattaya, Bang Saray and Baan Amphur areas available to rent on a short or long term basis or to purchase. 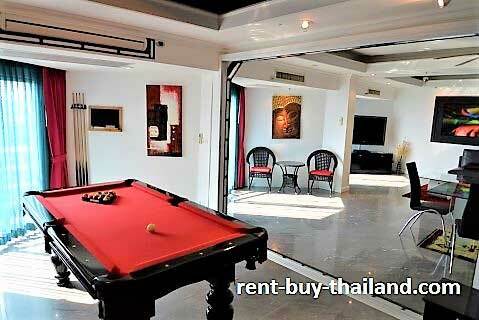 Studios, one bed and two bed apartments available for all budgets. Please continue browsing our website for a selection of our properties and feel free to fill in a contact form if you would like further details.